I joined the 2018 American Parkinson Disease Association (APDA) Optimism Walk to honor the memory of my friend Jo-Ann Golec, who died last year, having lived a third of her 77 years with Parkinson’s disease. This seemed a fitting memorial, as it was Jo-Ann who “brought me to the dance” almost 10 years ago, recruiting me to join her on the APDA Midwest Chapter Board of Directors, and teaching me the ropes. Jo-Ann was a passionate advocate for those who live with Parkinson’s, and a tireless fundraiser. Her annual Walk solicitation letter to her friends and family members, near and far, brought in thousands of dollars to help put an end to Parkinson’s. Hopefully, I will one day walk to celebrate the discovery of a cure made possible by the hard work and generous donations of so many over time. I recruited our friends, Claudia, and her husband, Carlos, to drive two hours to walk with my husband, Tony, and me. I knew their support and shared “remember when” stories would not only make the day more fun, but also motivate me to exceed my wildest expectations. My plan worked. Supported by my six-week old, hi-tech rollator walker, I made no stops, maintained a steady pace, and finished the course in 45 minutes. Both my adult sons proudly noted that I had not done this well in my last few times out, even several years ago. “Thank you, I guess it wasn’t a bad trade for my Porsche after all,” I jokingly responded. Jo-Ann would have enjoyed this exchange, as she had her own love affair with a two-door, luxury sports car she drove until the day she acknowledged that it was time to surrender her keys. Congratulations! Great job! 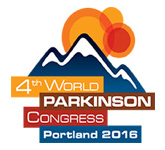 I would like to honor Kent, Ron and Ken who have all passed on this year while having Parkinson’s Disease. My husband is in his 20th year of PD, and I’m so thankful for him, for his attitude, and for his patience with me, his caregiver. 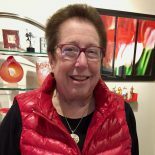 This entry was posted on September 17, 2018 by mydancingintherain in Back to Normal, Coping Strategies, Exercise, Family Life, Friends, Parkinson's Awareness, Partners in Parkinson's, PD Heroes, Support Groups, walker, walking sticks.